Overview: A top-level view of the artist, featuring a profile image, an abstract of her biography, and links to a selection of related artists (if available). 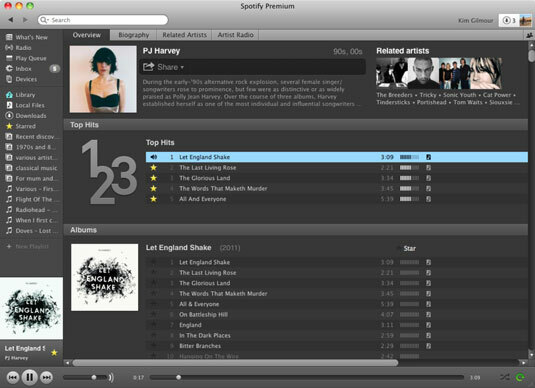 For example, you can see that artists related to PJ Harvey include Tricky, Sonic Youth, The Breeders, Cat Power, and Portishead. Below this information, you can find the artist’s discography, including her top hits on Spotify, followed by the albums she has released or has tracks featured on. Biography: Most artists who have a significant presence on Spotify have a Biography tab. Related Artists: An expanded view of the links to similar-sounding artists who appear on the Overview page. On this tab, you can click through to their respective Artist pages and start listening to their music. Wonderful! Artist Radio: A virtual radio station dedicated to the artist’s music, as well as related artists’ music. An artist profile’s Overview tab includes a biography, related artists, top tracks, and a discography.